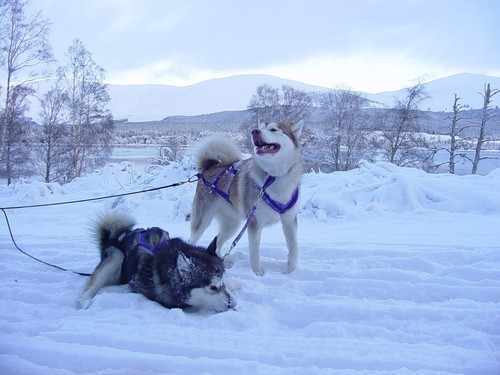 Alaskan Malamutes are not a breed for everybody. They can be demanding, strong-willed, boisterous, difficult to train, over bearing and sometimes aggressive in the wrong hands. As puppies they are incredibly cute, but these cutie-pies soon grow up into hairy Malamonsters!! However, if you have got this far, you may well be on the road to bringing one into your home! 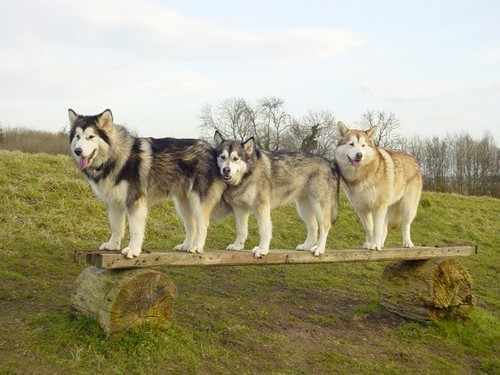 Malamutes can be trained and in fact they are incredibly intelligent. Physical punishment is not recommended. We have found Clicker training our Malamutes gives us great results in a positive and bond building way. A well trained (and tired!) Malamute is a happy Malamute!! Working, showing, weight training or back-packing with your Malamute is a wonderful way to keep them occupied and out of mischief! Their coats demand a fair bit of time for grooming. Our dogs are brushed 2/3 times a week to keep them in good order. Twice a year a Malamute will 'blow' their coat...........every last scrap of undercoat and some of the top coat will come out, meaning several weeks of hard work and hoovering. This fur creates tumbleweeds all over the house, in your food, garden and your clothes. Malamutes are not a dog for the house proud!! They tend to have a rather high prey drive and this needs to be taken into consideration if you have cats or other small furry or feathered pets. 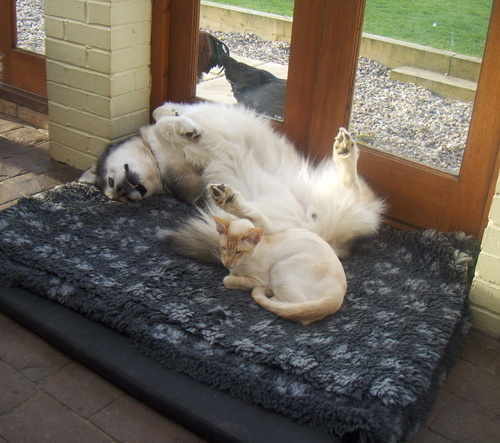 Our Malamutes live happily alongside our 3 cats and they are taught from an early age that cats are family not toys or prey. However it is wise to never leave a cat and a Malamute locked in the same room together without an escape route for the cat, baby gates give a good barrier if required for the cat to scale. Thorough research must be done before considering bringing one of these magnificent dogs into your household. Read as much as you can (internet & books) but best of all, go and visit people with Malamutes and see exactly what they are like to live with on a day to day basis. A good breeder will welcome an enthusiastic 'Wannabe Mal owner' to meet their dogs whether they have puppies available or not. Also visit shows and rallies, talk to owners about their dogs, find a 'type' or 'line' that you prefer. Temperament is very important, and along with health testing is high on the list of considerations. Be prepared to be thoroughly quizzed by a breeder. They need to ensure their precious pups go to the right homes, most will insist on meeting you before placing you on their puppy list and expect you to visit the pups before taking your new pup home with you. Don't be worried if you are asked to sign a contract. Reputable breeders will want to safeguard their puppies future by ensuring the dog is not passed on to anyone if you are no longer able to keep it or prevent it from being bred from indiscriminately. Why are they breeding this litter? Are there endorsements on the KC registration? - if not walk away!! 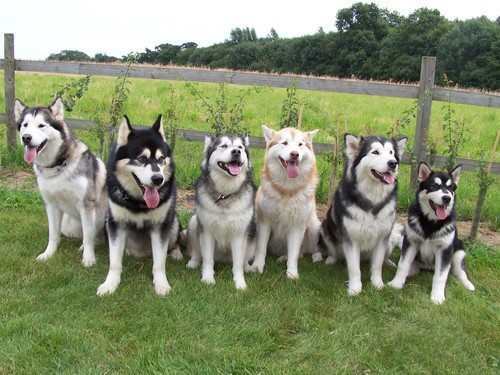 Also ensure that the breeder is involved in the Malamute world either showing or working their dogs. There really is no excuse to breed 'pets', both parents should have proved themselves in some discipline. Avoid adverts for Malamute puppies on certain un-reputable websites or free to advertise papers. Champdogs (link below) is a great way to find a breeder, they also indicate whether the breeder has undertaken the correct health tests, but make sure you inspect these when you visit the breeder. Remember your puppy will become a member of your family for 12 - 15 years and you will at some point need your breeder for help and advice, therefore choose wisely and get to know and trust your breeder before taking that fluffy bundle home! !